Home Perfect Bake recipes Feuilletine "Puppy Chow"
Feuilletine is a sweet, crunchy, cereal-like food commonly found in pastry kitchens. It's typically used to add a crisp texture to layered desserts, candy bars, and chocolate truffles. Baking and pastry supply shops might have it, but it's also easy to find online. 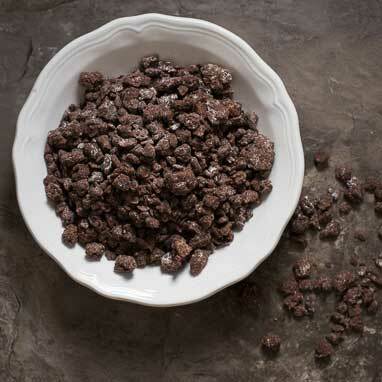 Pastry Chef Kristen Napoleoni at Clyde Common uses her Feuilletine Puppy Chow as an easy component for plated desserts, but it also comes in handy when she's looking for a sweet snack. It's a fun decoration on cakes and a delicious topping for an ice-cream sundae.